The amazing book app has so much information it would take days to video even a large portion of it! 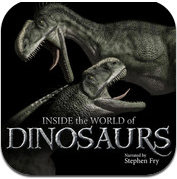 The book app contains over 60 fully interactive dinosaurs as well as fantastic narration. There are 310 interactive 3D images to manipulate with the tip of a finger. Videos of dinosaurs in the middle of a battle. You can zoom out (pinch) to bring them to full screen these 84 videos! Stories on many dinosaur hunters are included as well. Brought to us by M5859 Studios Pty Ltd., this book app is a very valuable tool for your kid’s toolbox for life! What was the initial inspiration for Inside the World of Dinosaurs? M5859 Studios was formed in early 2011 to develop and produce cinematic style, education apps for iOS platform. Due to my early love of dinosaurs as a child, I decided to build an app on dinosaurs, the first title from our studio, that would defy gravity and take education apps to a whole new level in terms of cinematic style modeling and animations. Ever since I was a child I’ve been fascinated, like most children, by dinosaurs in movies and books. Due to the mystery behind them no other animal has quite captured everyone’s imagination like dinosaurs. I saw many interactive books appears on the iOS platform in 2010, and could see a trend in high-quality 3D modelling educational apps. We knew that no app developer had undertaken a hand-made, built from the ground up dinosaur app, so we decided to build one from scratch, complete with 60 fully rotatable dinosaur models, 40 mid-air fight 3D models and high-quality recreations of dinosaurs fighting. My favourite aspect of the app is definitely the 40 mid-air fight 3D models. Our animation team worked for 12 months to create 40 previously unseen fight sequences filled with action and excitement. Based on actual fossil data discovered in 1971 in the Gobi Desert, the team recreated the world’s first 3D reproduction of the famous fossil of a Velociraptor and a Protoceratops locked in an eternal fight-to-the-death struggle. To me, that was the most exciting part of building this app, the fact that we were re-creating dinosaurs as they were found in fossils, and dinosaurs fighting in mid-air, in ways that people have never seen before, and that each of these turntables can be rotated in 3D. We are working on an iPhone app at the moment and other languages for the iPad version. But yes, we will definitely be looking at the Android platform in the near future, and possibly other platforms.